Many thanks to Mike Duggan for the invite to publish in Living Maps Review! Emily Barrett and I authored a piece on our community-based mapping work, titled "Mapshop: Learning to Map, Mapping to Learn". View it online, open-access, here. "One of the premises of critical cartography and critical GIS is that mapmaking and GIS is worthy of study due to the possibilities for intervention—that how we know matters for what we might do. This sensibility toward mapmaking hit an inflection point in the late-1990s, as the GIS & Society debates reached fever pitch. Now, as we enter the third decade of these discussions, what might be the new possibilities for intervening with maps and GIS? What are the new capacities for resonate and responsible mapmaking? In an attention-economy how might we cultivate care differently? [ . . . ]"
Barrett, Emily, and Matthew W. Wilson. 2019. Mapshop: Mapping to Learn, Learning to Map. 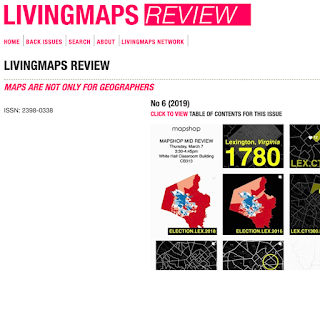 Living Maps Review. No. 6. Available at: http://livingmaps.review/journal/index.php/LMR/article/view/166.